The Skinny: Entertaining and workable kung-fu epic that's notable for the return of Jet Li and some truly awful acting from most of the cast. Jet Li’s much-heralded return as Wong Fei-Hong is in a respectably solid, if not well-acted, kung-fu western. 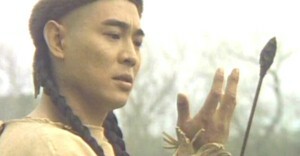 Plot: Wong Fei-Hong travels with Aunt Yee (Rosamund Kwan), and Clubfoot (Xiong Xin-Xin) to America to visit Buck Tooth Sol (this time played by Chan Kwok-Bong, who essayed the character in the TV serial), in a U.S. branch of Po Chi Lam. Along the way, the group picks up a righteous gunslinger called Billy, who’s played by the blonde and not-so-great Jeff Wolfe. Things go bad during a raid on their wagon train, Wong loses his memory and falls in with the Native Americans. Yee and Clubfoot meet up with Sol, but they can’t find Fei-Hong. Meanwhile, baddies plot to act badly and rob banks. The film's storyline seems entirely geared toward finding a bad guy to beat up in the second hour. When said bad guy appears, he's able to do some semi-decent kung-fu, which requires some suspension of disbelief but not enough to make the film less than enjoyable. Essentially the film is plotless, which is not surprising since this was a Tsui Hark production directed by Sammo Hung. At the very least, Jet Li shows some terrific presence and charisma. Despite Zhao Wen-Zhou’s excellent (and even underrated) take on Wong Fei-Hong, the role is really Li’s.